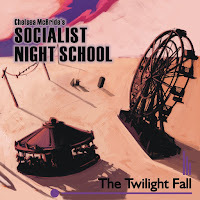 My interest in "The Twilight Fall", the first full album from saxophonist, composer, lyricist, and conductor Chelsea McBride's Socialist Night School (released on Browntasauras Records), was piqued when reading a review by Peter Hum of the Ottawa Citizen (read it here). Thanks to drummer. composer, and publicist Ernesto Cervini, the CD was waiting when we returned from a short vacation. 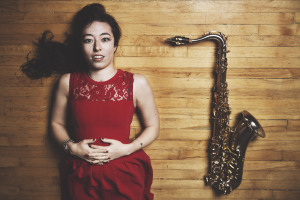 The 19-member CMSNS is a big band composed of active members of the sprawling Toronto, CA, jazz scene, guided and intellectually fed by the 25-year tenor saxophonist from Vancouver, BC. The 10 tracks have such disparate influences, from Carla Bley to Steely Dan to Bill Withers (the soulful "Spirits") to Darcy James Argue and more. The band has fine soloists including guitarist David Riddel, trombonist William Carn, trumpeter/flugelhorn player Brownman Ali (the album is released on his label), alto saxophonist Colleen Allen, tenor saxophonists Patrick Smith and Anthony Rinaldi plus pianist Chris Bruder but the emotional focal point is Alex Samaras (whose voice is heard on six cuts). His voice dramatically rises out of Ms. McBride's tenor sax melody on the opening ballad, "Ambleside" - the lyrics speak of longing for answers while the music (with echoes of Maria Schneider and Stephen Sondheim) slowly opens only to fade out (the piece returns and resolves later). The album then takes off on the nervous energy of "Intransitory", the melody, played by the reeds, is colored by the brass and pushed by the rhythm section (great work throughout by bassist Steven Falk and drummer Geoff Bruce) opens up to powerful solos from Ms. Allen, Riddel and the drummer. The dynamics range from quiet to roaring and the arrangement highlights excellent work of baritone saxophonist Conrad Gluch. The title track is episodic, opening with a melody that sounds, for the life of me, like the theme from the BBC mystery series "Foyle's War" but, with the addition of the brass, moves into a different dimension. There's a Latin feel for the guitar solo which closes on a clash of sounds as Ali's trumpet rises out of the dissonance. The piece stops short, coming back in a waltz tempo while the trumpet, now backed by a vocal choir, flies forward. More changes ensue, the tempo increases then slows down to reveal Ms. Allen's alto and Ali's trumpet improvising over the opening rhythm to the close. It's such a smart piece, intelligent without trickery. As one moves through the program, there's the funky "Smooth" and "Spirits", both featuring Samaras's strong vocals and fine arrangements. The latter track leaves behind its Bill Wither's sound behind to move in several different directions, including an "Aja"-like arrangement of voice, brass, reeds and voice. Other highlights include the "Arrival of the Pegasus", a tribute to the TV series "Battlestar Galactica", replete with powerful drums and a splendid arrangement for the reeds and brass. A bluesy sway introduces "Foot In Mouth" but this is a piece with many pleasures tucked inside. The handsome melody, the brass counterpoint, the solid work of Falk and Bruce, the soulful piano triplets, and then there's Rinaldi's powerful tenor solo over a straight-ahead walking bass line and propulsive drums. It would be easy, and somewhat unfair to the curious listener, to write about every track. Let's just say there is not a dull moment on "The Twilight Fall", that the blend of jazz, pop, soul, funk and what-have-you is extremely appealing. There's humor, sadness, introspection, and joy in this music and lyrics. Chelsea McBride's Socialist Night School might not be a politically correct name in these uncertain times; take heart, Ms. McBride's infectious spirit and music is antidote for the real-life blues. For more information, go to crymmusic.com. 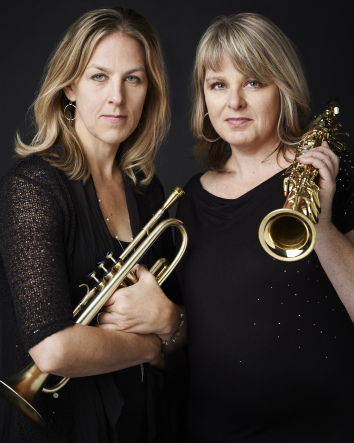 The sisters Jensen - Ingrid (trumpet, electronics, kalimba, melodica) and Christine (alto and soprano saxophones) - are a formidable force in contemporary music. 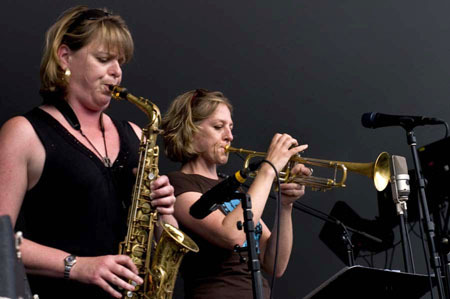 Ingrid may be best known for her work with the Maria Schneider Orchestra, Terri Lynn Carrington, and her own ensembles while Christine's small and large ensembles (many including her sister) have won numerous awards in their native Canada. They have recorded together as Nordic Connect and now have a new album, "Infinitude" (Whirlwind Recording) that includes guitarist Ben Monder, bassist Fraser Hollins, and drummer Jon Wikan. The music reflects their Canadian heritage as well as their willingness to go where the spirit takes them. The spirit of trumpeter/composer Kenny Wheeler (also a Canadian native) permeates this music; one hears it in the atmospheric sounds, the openness of the melodies and harmonies, and in the ECM-like echo and sustain. The quintet also performs "Old Time", a Wheeler piece that the trumpeter recorded on his final ECM album (2015's "Song for Quintet") - it's a rollicking tribute powered by Wikan's thundering drums. One of the joys of the album is how the music goes in so many directions from the gentle joyousness of "Blue Yonder" (which builds off the delightful kalimba rhythm in the introduction) to the sound sculpture that Ingrid and Monder create on "Duo Space" (which opens quietly but heats up on the strength on the roaring guitar) to the soulful "Dots and Braids" in which the five voices move in and around each other until Wikan and Hollins lay down a slow tempo for the trumpet and saxophone to interact. "Hopes Trail" is a lovely ballad, it's handsome melody suggesting a walk on a Spring or early Summer day, the trumpet and soprano sax strolling on the path the rhythm section creates. The energy picks up under Christine's lovely solo as if the walker had gone into the city center from the country. "Octofolk" also opens in a easy manner; it's simple melody lines lead into bassist Hollin's melodic solo, Monder's gentle rumination, and an energetic alto sax solo. The interactions of soprano, trumpet (with effects), and guitar (with loops) on "Trio: Garden Hour" have a gentle, classical, feel that also suggests the work of Wayne Shorter in the way the contrapuntal melodies played by the sisters sound like a call-and-response. Monder's "Echolalia" builds off his finger-picked folk-like rhythm, Wikan's active brush work, the foundation bass lines, the rising melody line that soon leads into a powerful trumpet solo. The drums really drive this piece, the active snare and cymbals creating an irresistible energy. 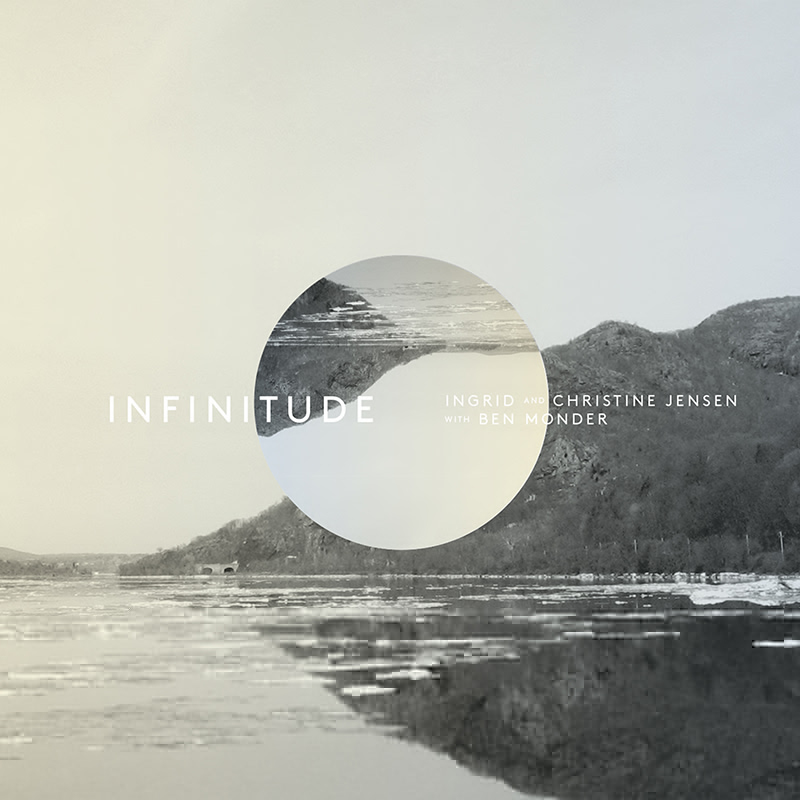 "Infinitude" works on so many levels and is easy to listen to all the way through. One hears the comfort the musicians have with each other, not afraid to be challenged by the material and to challenge each other. Beauty, power, melody, noise, all enter the sonic soundscape and keep our attention. Ingrid and Christine Jensen also gives us hope in these crazy times. For more information, go to www.whirlwindrecordings.com/christine-ingrid-jensen-l/. 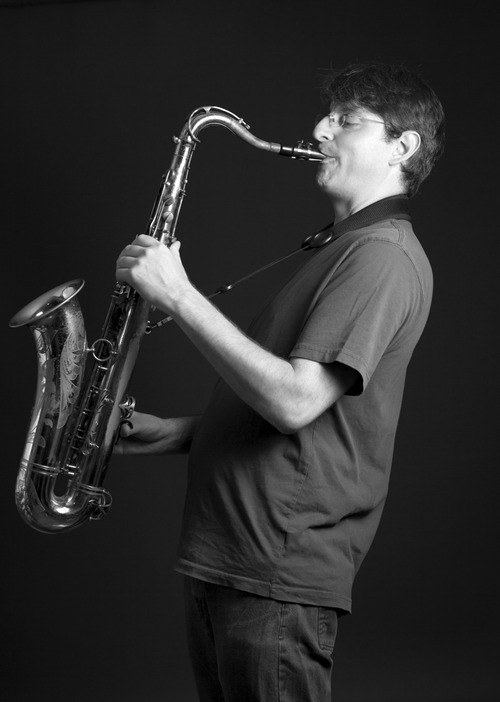 Tenor saxophonist, clarinetist, and composer Adam Schneit, while not from Vancouver, Canada like the Jensens and Ms. McBride, does hail from the great Northeast of the US, Portland, Maine, to be exact. He first came to critical notice as co-leader of Old Time Musketry, a quartet that combined Americana with a sense of humor as well as one of adventure. That group released two albums and broke up after the release of the second recording. Now he has own band, one that features all original compositions and the contributions of Sean Moran (guitar), Eivind Opsvik (bass), and Kenny Wollesen (drums). 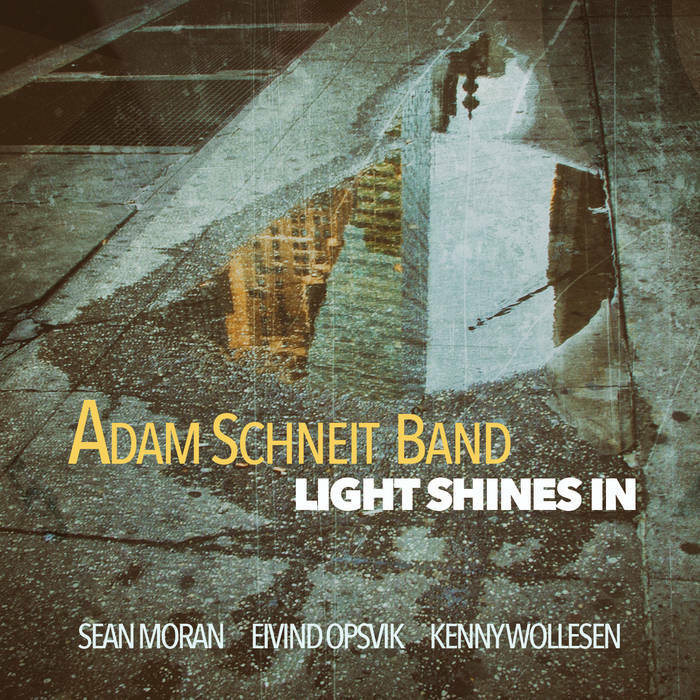 The ensemble's debut album, "Light Shines In" (Fresh Sound New Talent), has music that remind some of Schneit's previous band but also ups the ante with songs that have the power of Ornette Coleman's work with Pat Metheny; you hear that influence on pieces such as the incendiary "Different Times" and the hard-edged "My Secret Hobby", the latter powered by Moran's wailing guitar and forcefulness of the rhythm section. There's also the lovely title track, the leader's handsome tenor moving easily over the active brush work of Wollesen and Opsvik's counterpoint. The bassist also takes a splendid melodic solo. Schneit pays tribute to his previous band with a song bearing their name. The piece captures the spirit of that ensemble but also has the "pop" leanings of the Daniel Bennett Group. The tenor solo covers a wide swath of melodic and sonic territory, dancing along atop the splashing cymbals, chunky guitar chords and bouncing bass lines. The sweet ballad "Hope for Something More" has a Neil Young feel in its melody and execution. Schneit moves to clarinet; he's an accomplished player with an attractive woody tone. The rhythm section work is spare but just right for both the leader and Moran to create substantial solos. The final track, "Song for Silence", has a similar feel. It's slow, more languid than lugubrious, with the musical voice of each player standing out. Opsvik's bass is the foundation while Wollesen pushes the piece forward without forcing the pace. Creative music is so often a fusion of styles or, better, a blurring of genres. "Light Shines In" has influences in the blues, country, jazz, and folk music, stirs in a generous helping of melody, conversational interaction and a sympathetic rhythm section, and asks that you just listen. 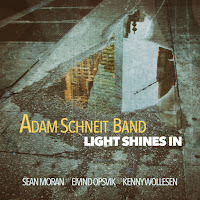 If you spare the time, the music created by the Adam Schneit Band will give you much pleasure. For more information, go to adamschneit.com.